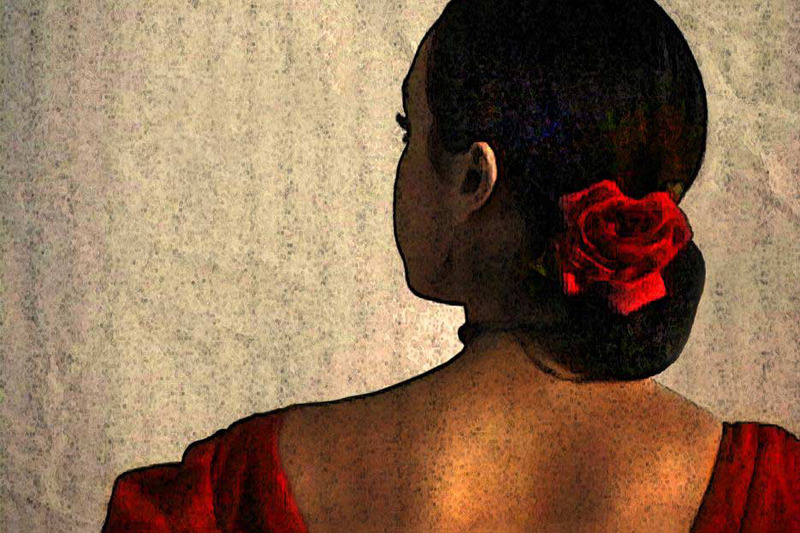 We have turned the beauty of [Monet’s] painting with a brush to painting with our bodies and shoes to the compas (flamenco rhythms) of the guitar. We have turned a delicate stroke of a brush into a delicate floreo (handwork), a dip of a brush into a tacon (heel) on the floor. We use our bodies as a brush, the walls as our canvas, and the guitar to feed our imagination. We take Monet’s joy in his paintings to inspire a Seguiriya & Alegrias with bata de cola. We translate his pain with a Solea, his innocence with a Garrotin, and his love with Tientos y Tangos. Joining Mina Fajardo and Monze Diaz is a third dancer, Sveta Backhaus. Joining them onstage is special guest singer, Roberto Zamora, a renowned flamenco singer and painter from San Francisco, and guitarist Eloy Cito Gonzales. La Compañia Chuscales y Mina Fajardo has performed many original concerts with dramatic themes at Teatro Paraguas, beginning in 2013. These include Flamenco x3 (2015), Una Nota de Lorca (2016), Choreography & Calligraphy (2017), Dance with Spirit (2017), and Carmen la Golondrina (2018). Mina has trained extensively in flamenco, Escuela bolero, jazz, tap, and ballet. She trained under many renowned flamenco artists, including El Guito, Carmera Greco, Ciro, La Tati, La China, Alejandro Granados, and Yolanda Heredia. Mina has taught at the Maria Benitez Institute for Spanish Arts, Northern New Mexico University, Santa Fe Community College, Eva Encinias Sandoval’s National Institute of Flamenco, Casablanca Studios, Moving Arts Española, as well as Maria Vazquez Flamenco Denver, the Spanish Institute of Dance in Houston, and Fazil Dance Studio & Japanese Chamber of Commerce in New York City. Fajardo has performed in Japan, New York City, San Francisco, Boston, Denver, Houston, Maryland, and Albuquerque. In Santa Fe, Mina has performed at the Santa Fe Opera and the Santa Fe Jazz and International Music Festival at the Lensic Theatre. Saturday • September 29 • 7:30 p.m.
Sunday • September 30 • 6 p.m. This project is made possible in part by New Mexico Arts, a division of the Dept. of Cultural Affairs, the Santa Fe Arts Commission, and the 1% Lodgers’ Tax, and the Witter Bynner Foundation for Poetry.